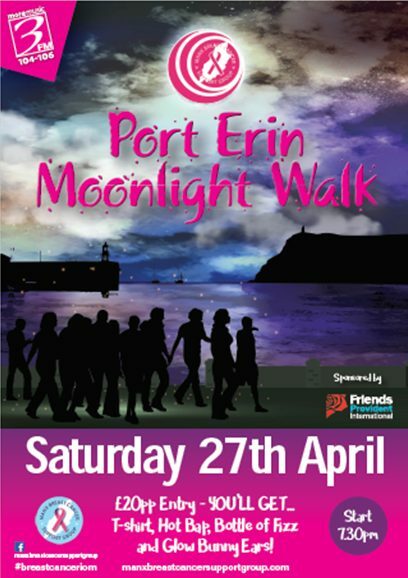 On Saturday 27th April at 7.30pm, grab friends and family and join us for a fabulous moonlightwalk.im sponsored by Friends Provident around Port Erin Promenade. Walk at a leisurely pace from the Bridge Book Shop around to the Lifeboat station and back. You can buy tickets via the event and pick up T-shirt and bunny ears from The Sea terminal, the Wednesday before the event or sign on at the event, is from 7pm on the night at The Bridge Shop Bookshop on the promenade. Registration is £20 for over 18’s – this includes a t-shirt, glow bunny ears, a bottle of fizz, hot bap. Under 18 is £10 includes glow bunny ears and a hot bap and drink. Please register and pay here – **Please note you do NOT need a PayPal account, it just needs your email address and bank card details to pay. Click the ‘select options’ button to choose your ticket type.